On a summer day when the kids are looking for something to do, ask them to help you pack up a picnic. No matter where you picnic (the backyard, the park, or by the sea), eating outside will feel like an adventure. Read our tips before you get packing! Food for your picnic can be very simple – like sandwiches or salads, fruit slices, and a sweet dessert to finish. With your encouragement, kids can help prepare most of the picnic basket. Pack it all up with a basket, a blanket, and some fun extras like party napkins or straws, a cold keeper pack and be certain to bring along a trash bag for cleanup afterward. Head for your favorite sunny spot in the backyard, or add some exercise and take bikes to a nearby park, or have your picnic at a local lake or river picnic area! On your next summer picnic, pack up this colorful, high protein side dish. 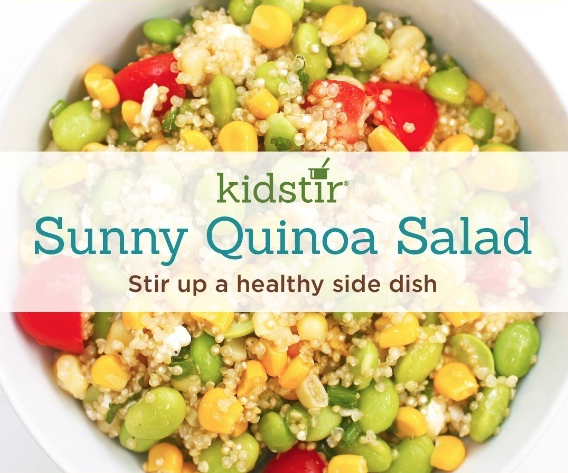 It’s made with quinoa, edamame, corn, and other veggies. Kids (and grown-ups!) will eat it up fast! It’s made by kids using the following tools: tools: measuring spoons and cups, cooking pot, a paring knife, cutting board, a large bowl and a small bowl, a large spoon and finally a whisk. This kids recipe teaches them kitchen skills like measuring, cooking at the stove, chopping and stirring. Grilled cheese? PB&J? B.L.T? Which sandwich is your favorite? This month it’s time to celebrate the ultimate on-the-go healthy meal. Sandwiches are a great way to get in more fresh veggies, whole grains and lean proteins. 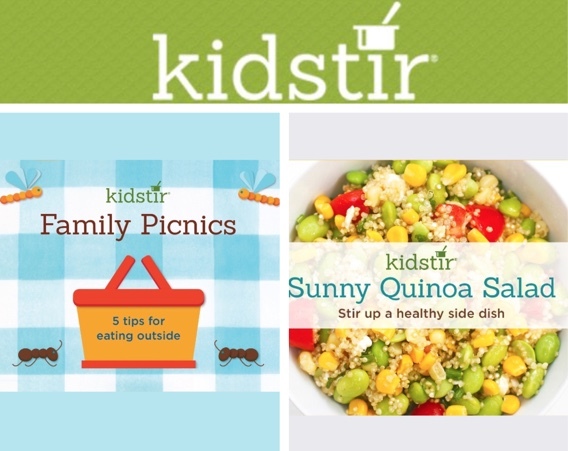 Check out the recipes in the Kidstir Sandwich Shop kit for more great ideas! Whether you’re enjoying the last days of summer or getting back to school, we’ve got you covered!